St. Mary’s by the Sea and much of Black Rock used to belong to Fairfield. Mr. PT Barnum thought that area was much too beautiful to belong to the hokey farmers in Fairfield so in the 1880s he annexed the area. 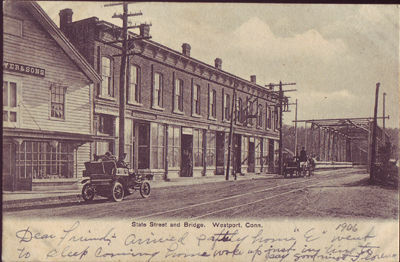 Westport was made up of parts of three towns, Weston, Norwalk and Fairfield and was incorporated much later than those towns, almost 200 years later. Southport used to be its own town and was a vibrant port of the large onion trade route in CT. By the 1890s, Market ships such as sloops and schooners, carried 100,000 barrels of onions, plus carrots, and potatoes from Southport to New York City from July to September. Coleytown, in the northern part of Westport was named after the Coley family who owned lots of farm land in the area. Morris Ketchum, one of the wealthiest Americans in the mid 1800s owned quite a bit of the town and Abraham Lincoln asked him to help finance the Civil War. Ship building became a profitable business at the deepwater harbor in Black Rock in the early 18th century, with local shipyards known for their fine craftsmanship. On July 18, 1640 the Siwanoy Indians, for the price of 25 English coats, sold the land that is now Old Greenwich to four Englishmen. Edmund Cogswell Converse, an inventor and then financier, owned a 2000 acre estate in Greenwich near the NYS border. He died in 1921 and his estate was vacant for almost 20 years afterward. Ernest Thompson Seton, started the Boy Scouts of America in Cos Cob). Cos Cob today is a robust community with a central downtown shopping district along the Post Road. The land that now forms the city of Stamford was bought for 12 coats, 12 hoes, 12 hatchets, 12 glassess, 12 knives, four kettles, and four fathoms of white wampum. The Native Americans called it Rippowam. There were Trolley tracks in Westport until the 1960s. Miss Annie Burr Jennings was the owner of an estate called Sunnie Holme on Beach Road in Fairfield for many years in the late 1800s until her death in the 1940s. Her home with its secret sunken gardens and grottos meant to much to her that she ordered it demolished after her death. You can still see remnants of the gardens in the middle of the development built in the 40s after the property was subdivided and sold. In 1884 a group of bankers and financiers purchased land to create a residence park in Greenwich. The price of the land was $46,000 and is now known as Belle Haven and is a lovely waterfront community. Binney Park in Old Greenwich was donated by Edwin Binney of Binney & Smith, makers of Crayola Crayons which were invented in 1903. Raggedy Ann was invented by Johnny Gruelle in Norwalk, in 1915. Many famous actors have played at Westport Country Playhouse in Westport, at the White Barn Theatre in Norwalk, at Wilton's Playshop. There are at least eight pick-your-own farms in Fairfield County and many more in the adjoining counties. Cobb's Mill Inn in Weston was formerly a lumber mill. A blight of the American chestnut forced it to close lumber operation. It continued as a grist mill and cider mill until it was turned into one of the most romantic restaruants anywhere with a waterfall setting. In Weston, on December 14, 1807 the pre dawn sky was lit up by a meteor shower. The meteor, known as the Bowditch Meteor, was seen as far south as NYC. When the account of it reached President Thomas Jefferson, he didn't believe it and said the two yankees were lying. Westport had several hotels that were frequented by the wealthy from NYC in summer. PT Barnum's Bridgeport house was the most elaborate home of its day. It no longer exists but you can see a model of it in the Barnum Museum in Bridgport. Many of Stamford's orginial white residents were puritans that moved from Wethersfield, CT. So much of Fairfield was burned by the Brittish during the Revolutionary war that it took decades to recover. Westport's Parker Harding Plaza behind the stores in downtown Westport didn't exist until the 50s. The river water used to come right up to the stores. No houses were destroyed in Wilton during the Revolutionary war even though some were set afired from the Brittish. Wilton was a part of Norwalk until 1803. There were no civil war battles in Connecticut. Wliton historical sociey has one of the best collections of antique clothing anywhere. Phineas Taylor Barnum, was born Bethel and remained there until the winter of 1834-35. Bethel was known for its hats, shoe and comb industries in the 1800s. Eight Norwalk, Connecticut families walked to the area now known as Danbury and Bethel in the summer of 1684. Wilton was a stop on the underground railroad and at the forefront of the anti-slavery movement in CT.
Dorothy Hammil stated at Binney Park in Old Greenwich and there's a plaque there in her honor. Most of Newtown's first settlers came from Stratford and Milford. The town of Newtown, originally known as Quanneapague, was purchased from the Pohtatuck Indians in 1705. Newtown's famous flag measures 20 by 30 feet! The Keeler Tavern , a Ridgefielf inn and museum, features a British cannonball still lodged in the side of the building. A 2 volume book was written about the town of Ridgefield in the 1850s by Mr. Goodrich who went into great detail but he didn't use any names only the first initial of the person's last name. The Weir National HIstoric Site which straddles Wilton and Ridgefield is the only National Park property in CT and preserves the farm of J. Alden Weir, famed impressionist painter and serves as a center for artists who are still in residence there. The flower gardens there are magnificent. By 1822, Ridgefield was a thriving center of commerce with various industries that included 40 shoemakers. Monroe was known as Old Stratford and named after the president James Monroe. Most of the first settlers came to Monroe from the Stratford area because they were running out of farm land along the shore towns. You can find Bison liviing at Silverman's farm along with dozens of other animals. Easton used to be called North Fairfield but was carved out of Weston.! Easton is no metropolis. Don't look for a downtown area, there are a couple of convenience stores, and gas stations and that's about it. But you'd be hard pressed to find a more beautiful area than Easton. In Trumbull, Native American Jack Skicket who lived on Dayton Road near Lake Avenue wove baskets so tightly that they could hold water. The Bush-Holley House in Greenwich has nothing to do with either President. but it's a wonderful museum showcasing the home as one of the birthplaces of American Impressionism.